Most of Ontario’s waterfront property owners rely on on-site wastewater treatment systems to manage our household water. Understanding how our systems work and the importance of maintaining them is important to protect our lakes and rivers from contaminants. View the links below for more information. 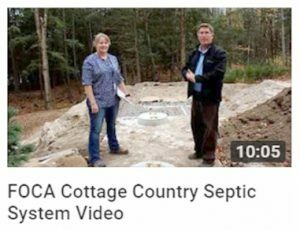 Also, watch video of Rick Esselment of OOWA speaking at the June 2018 Hastings Highlands event, Poop Talk & Aliens, on the subject of Septic Systems: the good, the bad and the ugly (video, 1 hour). This video was made possible by a cooperative effort of Hastings Highlands Council and Interlake Group. ongoing 2018-19 Project: Exploring Septic Maintenance Programs – FOCA has undertaken a collaborative research project with university and organizational partners to explore successes, challenges, and lessons-learned via Ontario municipal re-inspection programs for residential on-site wastewater systems, commonly called septic systems. FOCA initiated the call for this research because of concerns brought forward by our members across Ontario. For more, visit the project webpage: http://rplc-capr.ca/septic-maintenance-project/. FOCA will release the final project report in 2019. UPDATE: To FOCA’s great disappointment, and despite a compelling case laid out for a better maintenance regime for on-site sewage systems made through the Environmental Commissioner of Ontario (see “Feb. 23” below), both the Ministry of Environment and Climate Change (MOECC), and the Ministry of Housing (MMAH) have stuck to the status quo. In the MOECC response, they countered that high priority risks from sewage were already being addressed through the Clean Water Act (which only considers municipal drinking water sources) and that, through the existing Building Code, local municipalities were empowered to undertake further measures. In reality, this happens unevenly, with poorly understood results. The MMAH response referenced the fact that the OBC Part 8 had just recently (2016-17) been reviewed by a technical committee, and they reiterated that during this review they made a political decision NOT to mandate a tank pump out. They also took no interest in any related provisions such as requiring record-keeping or other maintenance obligations. Continued: February 23, 2018 – Having long been concerned about the inadequacy of the Ontario Building Code to deal with Maintenance and Management of onsite sewage systems (septic systems), FOCA, along with the Ontario Onsite Wastewater Association (OOWA) has filed a Request for Review with the Environmental Commissioner of Ontario. FOCA’s input to the proposed OBC changes can be found here. Need an onsite wastewater expert? Visit the Ontario Onsite Wastewater Association’s “Find an Expert” search tool.